Online forums provide an outlet for drug users — and a source of information for UNC researchers like John D. Martin, III, who believes that studying these platforms may be the key to addressing abuse. 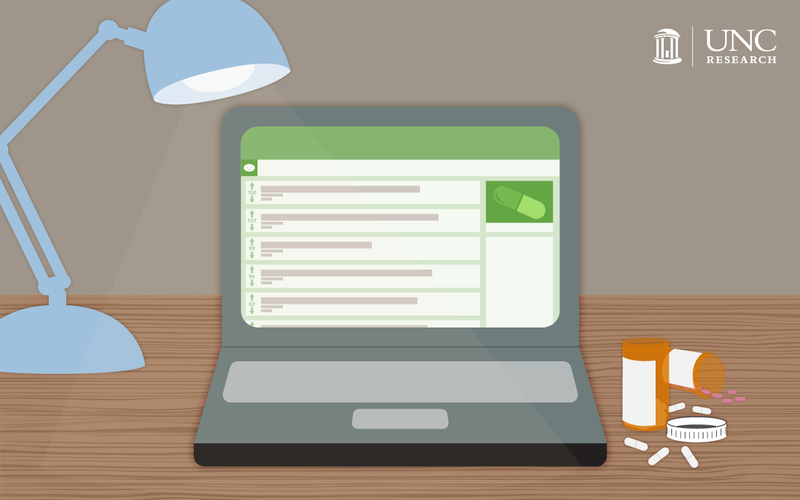 People use social aggregation websites like Reddit to create drug forums to discuss use, addiction, and rehabilitation. Aman sits on a train traveling from Denmark to Sweden. The duffle bag next to him contains several pounds of marijuana. The train slows sooner than predicted, and he tenses — when it crosses the border, the Swedish police will check passengers for illegal substances, and he has a loton him. He rushes to the bathroom, climbs on the toilet, removes the ceiling tiles, and empties the contents of the duffle bag. After sliding the tile back in place, he exits the bathroom and walks calmly back to his seat. When the police check his bag, they find only the roll of tape he used to hide the drugs. When they leave, he takes out his phone, opens the Reddit app, and posts his story to a marijuana forum. “These are places where people feel comfortable talking to one another because they share some common experience,” Martin says. While the data he obtained revealed a number of possibilities for further research, it also uncovered several ethical questions about online privacy and data collection. Web scraping formulas scan web pages for particular HTMLtags and pull their content out into a data set. Neal Caren, a sociology professor who created a video series on web scraping, says this is not a highly technical process. “Anyone who knows a little about web coding could learn it in about three hours,” he says. Web scraping is great for analyzing trends through large amounts of text, according to Caren. Often, web scrapers will count the number of times a site used a certain word or phrase, but Martin’s team went further and attached qualities to the different ways users revealed they engaged in illegal activity. “We went into it with the intention of investigating not necessarily why people disclose potentially incriminating information online, but how they did it,” Martin says. When he submitted the research plan to the only non-biomedical Institutional Review Board on campus (UNC has six IRBs, five of which deal with biomedical research), Martin expected them to supervise the study, since the research involved data from real people. But the board told him it did not fall into the category of human subject research and, therefore, was not subject to oversight. To protect the identities of the forum posters, the researchers do not include usernames in the report, and they changed the wording of some of the posts while keeping the meaning intact. So someone who comes across the study can’t simply copy and paste the text into Google and find the post. Martin understands the board’s decision, since all the information is public, but he is still concerned about what it means in terms of privacy. Besides sharing stories about drug use, many forum users ask for advice on how to use drugs or how to combine them. Some of the discussion is about recovery from addictions. One user remarked he was in recovery, and that “r/opiates” was actually a trigger for him. “He missed that community,” Martin says. “But a bunch of people were like, ‘If this is a trigger for you, and you’re in recovery, you shouldn’t be here,’” Martin says. This willingness to share could provide some public health solutions to drug abuse. One way to use this data could be to plant people in these forums to intervene when a discussion approaches physical or legal harm to the poster. Another involves using web scraping as an automated tool for these interventions. “What if we created a bot that looks for indicators in a drug forum where someone is about to combine substances in a way that might kill them?” Martin says. Law enforcement could use this tool to target people for investigation, Martin points out. Court sentencing recommendations have already moved to algorithms in some places, so to Martin, a world where algorithms look for illegal behavior online is not a far-fetched idea. “I don’t just think that’s coming. I know it’s coming,” he says. Although many of his colleagues do not use social media because they want to protect their privacy, Martin remains unconcerned about data gathering. Instead, he recommends keeping track of where your data is going and advises against using your real name online, unless it’s for a site like Facebook. He also stresses awareness of location-based data, as many tweets and photos contain information about where they were posted in the metadata. John D. Martin, III, is a PhD student in the UNC School of Information and Library Science. Neal Caren is an associate professor of sociology within the UNCCollege of Arts & Sciences. Elizabeth Kipp-Campbell is the director of the UNC Institutional Review Board and the Office of Human Research Ethics. Christopher Ringwalt is a senior research scientist at the UNCInjury Prevention Research Center and the Chapel Hill Center of the Pacific Institute for Research and Evaluation.